A touch of the past is present in each of our authentic barnwood frames. Most of the lumber used is of seasoned wood over 100 years old. The variety of shades are as different as the barns you see on country roads. 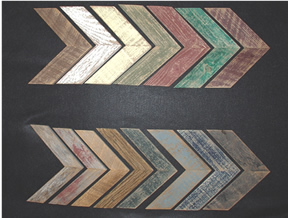 These barn wood frames come in a variety of natural weathered surfaces and color variations. Moulding sizes can also be adjusted to fit your needs. Available Colors: Faded Red Gray, Weathered Gray, Antique Brown, Barn Red, Antique White, Forest Green (grass green), Jungle Green (hunter green), Olive Green, Antique Blue (powder blue), Sailor Blue (deep blue), Black, Chocolate Brown, Black Cherry, & Butter Yellow. Click on sample corner image below to enlarge. We also have black easel backs and black metal Turnbuttons for 5X7 8X10 photo frames. Call for availability on additional sizes.